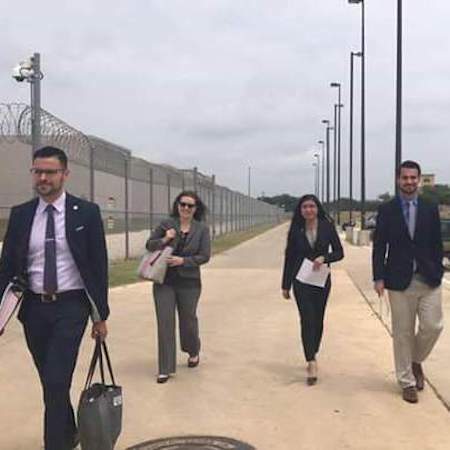 Professor Erica Schommer (second from left) and students approach the South Texas Detention Complex. Photo by Aglae Eufracio. St. Mary’s School of Law is known in the South Texas area for its emphasis on education for service, justice and peace. These values can be seen in action just 60 miles away from its campus in San Antonio at the Karnes County Residential Center, in Karnes City, and the South Texas Detention Facility, in Pearsall, where students and faculty are representing detained immigrant families and, more recently, separated immigrant family members. Students participating in St. Mary’s Immigration and Human Rights Clinic began their work with detained immigrants when the first family detention centers opened across the Southern border in 2014 in response to a wave of immigrants from Central American countries seeking asylum in the United States. St. Mary’s students often receive more requests for assistance than they can accommodate. Because of this, they make it a point to pick difficult or complicated cases where the person or people being prosecuted likely won’t be able to navigate the system on their own. The already strenuous situation at the border was exacerbated in April 2017 when Attorney General Jeff Sessions announced escalated efforts to prosecute those who cross through the southern border illegally. The “zero-tolerance” policy, as it came to be known, saw that all adults who were caught crossing the border illegally be criminally prosecuted. 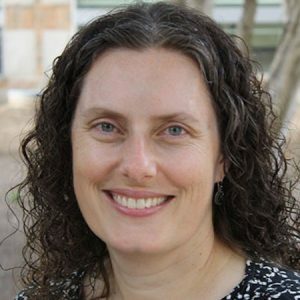 Schommer recalled a clinic she taught last summer where she and her students worked with families that had been detained in family detention centers; there, they encountered women who had been separated from a husband, sister, or mother. Advocates say that statistics on border crossings prove that claims by administration officials that detainment and separation act as deterrents are wrong. Perhaps the most dramatic effect of the zero-tolerance policy was the separation of children from their parents. Between the time that the zero-tolerance policy was implemented and when it was recalled about 2,300 children were separated from their families at the United States-Mexico border. As a result of litigation brought by the American Civil Liberties Union, a federal judge in San Diego ordered the reunification of separated families; the government and advocates continue to negotiate details of reunification plans under supervision by the judge. Schommer, who practiced immigration law for seven years on the United States-Mexico border from 2003 to 2010, said she feels a responsibility both as an attorney and as a human being to respond when crises like this occur. She expects “the blowback” of the Trump administration’s policies to continue into the fall. “I don’t really know what that response is going to look like in September or October or November but I’m sure that we’re still going to be dealing with fallout from these policies,” Schommer said.